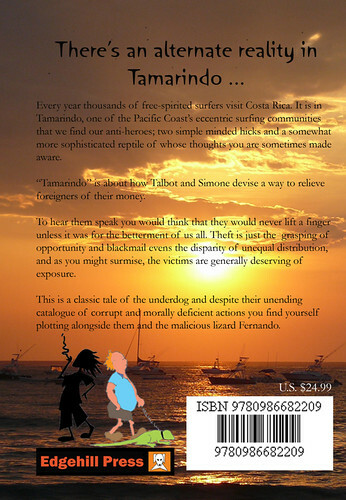 Edgehill Press has just released their new book, “Tamarindo; Crooked Times in Costa Rica – the author, yours truly. If you intend to visit Costa Rica this is essential reading, a humorous account of the practices of two drug dealers and a lizard who start a company that offers Vespa tours to surfers in the town of Tamarindo. 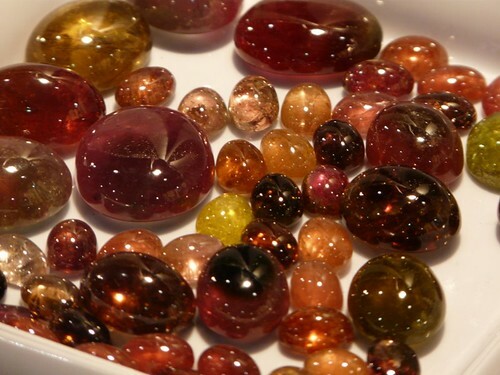 If I was asked to pick one gem as my favorite, it would definitely be tourmaline. Look at these colors. These cabs are in a tray that was displayed by a merchant at the Bancroft Gemboree. Red tourmalines are known as “rubellite”, one of the better known deposits being some 30 kilometers south east of Mogok in Burma where the gem is found in an alluvial bed of decomposing gneiss. Chinese miners generally worked this deposit as red tourmaline was needed for the buttons of mandarin’s gowns. 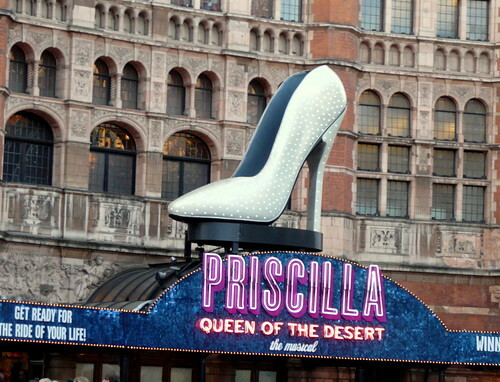 As a movie Priscilla became a cult classic in Australia and the UK. I’m not sure why, but Australians have this thing about ritzy performances in the roughest places – like ballroom dancing in a barn, or this documentary that I once saw of a black tie gala that was preceded by tuxedo’d men who were tearing around in dusty old pickups very drunk and cursing. Next morning it looked like there had been a battle with comatose Ozzies scattered across a torn up field amongst shreds of finery, bottles everywhere. Priscilla became so much a part of Australian popular culture that in the closing ceremonies of the 2000 Olympic games, a bus with a stiletto atop drove around the Olympic stadium with numerous transvestites in tow. Having enjoyed this incredible show in London, the cast came forward for their bow and Don Gallagher, the most serious of the characters (Bernadette) spoke about the need for charity and that profit from that week was being donated to some cause (I can’t remember what). As we left we were were asked to contribute what we could to the cause. I pulled out my donation which was not large (considering the restricted cash flow issue), but I was prepared to drop it in the hat or whatever. In following the crowd we suddenly found ourselves outside on the street in front of the poster and without an opportunity to contribute. I must admit, the show had been so fantastic and the appeal was so heartfelt that I was truly disappointed that we had somehow missed the opportunity to give. Anyway, what you see behind Maggie are some of the main characters, the million dollar bus and the 3 angels – red hair spiked up high with the incredible voices. After the disaster with the Visa that didn’t work, our unbelievably generous relatives sprung for theater tickets for what they suggested “Mick needs to give a chance as its really quite good.” Looks like the tickets were 65 pounds apiece which put us on the floor near the front. 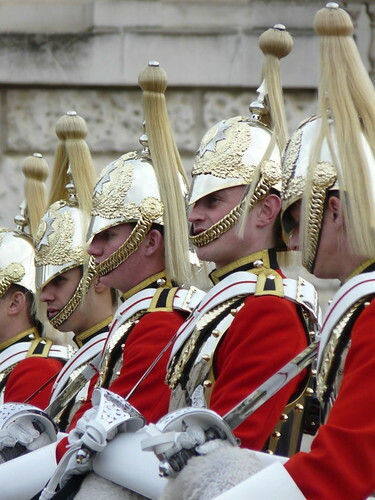 The nearest tube station was Leicester Square and emerging up the stairs we found ourselves in the noisy carnival of people, lights and entertainment that is London’s West End theater district. Everywhere there were booths that were selling half price tickets. 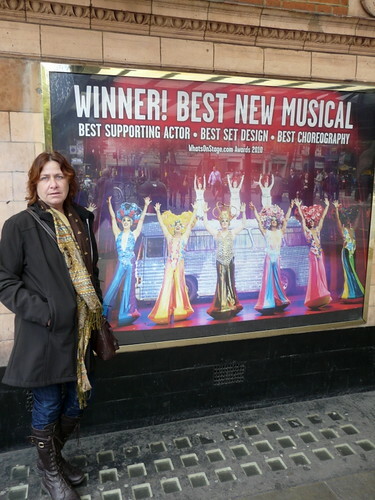 The best prices were on matinees – things like Stomp, Chicago, Billy Elliot and yes – even Priscilla. The theater itself – the Palace Theater – was built in the 1880s and when the freehold was purchased in 1983 by Andrew Lloyd Weber they removed the paint to discover incredible onyx and marble panels. Priscilla is the name of the bus in which 3 entertainers travel across the outback, headed for Alice Springs to perform at a casino that is run by the wife of one of these colorful fellows. Actually the entertainers are transvestites – highly talented as dancers I might add. What makes it a musical is that they lip sync the Supremes. The actual musical begins with 3 angels – well sort of angels – dropping down from the ceiling, they have phenomenal voices and the level of sound grows to quite an overwhelming volume. Priscilla somehow spins on stage, lights up as though by pixels as every square inch is possibly lit by a light bulb or some kind of illusion to make it appear that way. Half the bus is cut away and part of the drama takes place as they are driving and you see the inside of the bus in cross section – and of course there is that fantastic scene from the movie where one of these fellows is atop the bus (in this case sitting in the stiletto that is pictured above) with silk train blowing out behind. Moving from its position atop the bus the stiletto somehow slides right out over the audience. One thought though, I can’t imagine why some people took their children – it is certainly not for the younger audience. All in all, that was money well spent, it was very funny and high energy. Maggie and I are considering going in Toronto some time within the next few weeks to see how the Canadian talent compares. 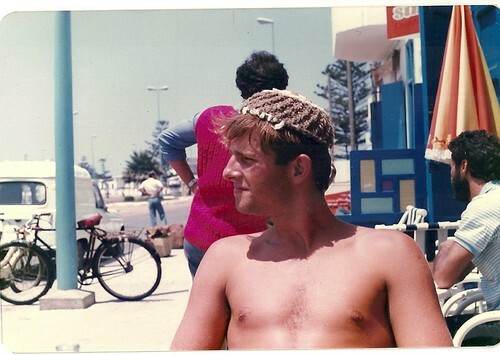 Bought the hat from a herder somewhere between Marrakesh and Essaouira – check out the tassel hanging down the back. As far as hats go Moroccans take the prize. How could you compare a John Deere baseball cap or a jays cap – I defy you with a fez; attire of extroverts like Oscar Wilde and any number of barons, princes, knights and eccentric English gentlemen. You’d never recognize me without the beard. I’m just chillin at a cafe somewhere along the shoreline. There is some association between this place with its medieval appearance, city wall and defenses and Jimmy Hendix’s song “Castles in the sand”. Though it seemed a quiet and somewhat unassuming backwater, a place where Moroccans come for honeymoon, Essaouria has quite a feisty history. Mohammad III chose Essaouria as his port city, like many before him for its sheltered anchorage, but also because he wanted to cut off trade from Agadir, a rival city to the south. This was also the closest spot between Marrakesh and the sea. In the past the waters offshore were harvested for Murex shells. It was from these thatpurple dye was extracted to mark the line in Roman senator’s togas. Today the Canaries Current makes the water off-shore particularly well suited to the swarming of large schools of sardines and super-size Conger Eels. As I later learned, It’s not considered good manners to go shirtless in public. Normal attire was flip-flops and shorts and a hat of some unusual variety.